Read it, hated it. He has very few facts, and most of his "factoids" are wrong. The Great Depression figures prominently in the article, and he blames greedy rich people. But that's simply not a plausible causal mechanism to explain the Great Depression. Similarly, people today, in general, are no more or less greedy than they were 10 or 20 years ago. It's also not a plausible explanation of our recent recession. "Learn from history" is good advice, but he has far too naive a theory of what happened in history, and why. Taxing the rich (more) might or might not be a good idea for society, but this article is just propaganda, written in support of class warfare, and based on jealousy. 1. You say that most of his "factoids" are wrong without citing any examples. What specifically do you think he got wrong? 2. It is a verifiable fact that the last time top marginal tax rates were as low as they are now was right before the Great Depression. That does not establish causality. But the fact that marginal rates were 80-90% throughout the 50's and 60's, a period of unprecedented growth, low inflation, and full employment, is enough to falsify the theory that high marginal tax rates produce bad economic results, at least by my quality metric. Whether there's a revolution ahead is, of course, debatable (and at this point still somewhat controllable). But I do see history repeating itself. The Fed tightening the the money supply in the early 30's surely made things worse then, and loosening credit is making things better now. But ongoing double-digit unemployment does not bode well for social cohesion. If you're on the street long enough you're not going to care much if some rich snob considers your desire for a roof over your head to be "jealousy" or not. 1. Factoids. I didn't express that well. Let me stipulate that all of his hard numbers are probably correct. (I don't know any better myself.) But the tone of the article is that "this data obviously implies...", and I disagree with almost all the implications. I could go through it line by line, but perhaps that's not productive in this comment space (unless you really want me to). 2. The data you cite from the 50's and 60's is interesting enough to suggest a hypothesis. But not a conclusion. You'd want to look at worldwide data, throughout history. That data does not support your hypothesis that high marginal tax rates don't lead to lower GDP growth. And let me just note that a very interesting fact about the US in the 50's and 60's, is that most of the rest of the first world had just been destroyed by WWII, while the US industrial capability was essentially untouched. A great strategic position, if you can get it. 3. It is my opinion that the Fed and the money supply is the entire story. I have been convinced, over the last few years, by Scott Sumner, via his blog The Money Illusion. Until a few years ago, Sumner was a little-known macroeconomist, laboring out of an obscure university. But he's been beating the same drum since the recent recession, and, one by one, the other prominent economics bloggers have given him his due. I've yet to see any sharp critique of Sumner's ideas. At best, other economists ignore him -- but they don't counter him. Unfortunately, Sumner is a rather verbose, and not always interesting, writer. And I'm not sure if he has an easy short introduction in his volume of blog postings. The easiest introduction seems to be this recent 15 minute video he made. You can't have it both ways. Either it has "nothing at all to do" with it, or there's a (positive) correlation. And while I haven't actually done the math, a casual inspection of the data indicates that marginal rates and unemployment are strongly anti-correlated, at least since the end of WW1. There's a lag, of course, but we've done the experiment twice now, once in 1925 and again in 1988. In both cases the results have not been good. Of course, correlation doesn't imply causality, and in fact I think that deregulation of the financial industry has a lot more to do with our current difficulties than marginal rates per se. But low marginal rates and deregulation are highly correlated. And since we are still doing the same experiment -- nothing has changed since the panic of '08 -- we're probably going to have another crash some time in the next few years. And it's likely to be a duesy too. Between 1940 and 1980 we had no financial panics in the U.S. Since then, with the advent of deregulation, we've had three, and each on has been worse than the one before. Since there have been no substantive policy changes, there's no reason to believe this trend won't continue. Which three crashes? The stock market in '87, dot-com in 2000, and the 2008 recession? There's a difference between asset bubbles, which sometimes rise and pop, vs. an economy-wide financial crash. 2008 might have been a mere local-industry problem, in subprime mortgages, and financial services like Lehman. The 2000 dot-com crash was terrible for high-tech, but barely affected the rest of the diversified US economy. 2008 wasn't local like that, and the fault is due to the US Fed. I would be willing to bet, that the next five years will have no (additional?) economy-wide recession. I think you're totally off base, blaming deregulation. And as for 1940-1980, wasn't there an oil crisis in '73? And stagflation throughout the '70s? Doesn't seem like a particularly well-run economy. But back to the original post: the article presents a framing of rich elite kings lording over poor oppressed peasants, with the idea that the peasants will eventually revolt. And that the only solution is redistribution. That's a terrible mindset to get in to. Unemployment among the poor is a real problem, but the solution is growing the economy. Wealth can be created, not merely redistributed. The question of marginal tax rates, ought to be an empirical/economic question, of which policy leads to better overall GDP growth. It's silly to treat it as a moral question, where the answer is apparently obvious, based on mere intuition about "haves" and "have nots". Maybe I should have used the term "financial crisis." I was referring to the S&L scandal (remember that? ), the dotcom bubble, and the housing bubble. > 2008 wasn't local like that, and the fault is due to the US Fed. Really? What do you think the Fed should have done that it didn't do? > I think you're totally off base, blaming deregulation. But the facts are pretty solidly on my side. > wasn't there an oil crisis in '73? That wasn't a financial crisis. That was a commodity crisis. > And stagflation throughout the '70s? Which was a direct result of the commodity crisis. > The question of marginal tax rates, ought to be an empirical/economic question, of which policy leads to better overall GDP growth. It's far from clear that overall GDP growth alone is the best quality metric. But it *is* a moral question. How wealth is distributed in a society is not a simple consequence of the laws of physics, it's the result of decisions made by humans. There are people on the street today not because of any choices *they* made, but because of choices made for them by people they probably didn't even know existed. And I'm not referring here to people who bought houses they couldn't afford, I'm referring to people who lost their jobs and can't find new ones. What do you think the Fed should have done that it didn't do? The Fed allowed nominal GDP (NGDP) to plummet in 2008. They should have expanded the money supply sufficiently to maintain a trend-level (~5%) annual growth in NGDP. Maybe you're asking "how", what specific tools do they have to do so? Especially since some people claim that we're in a "liquidity trap", and the Fed Funds rate is already set near zero. You might notice that the (a?) 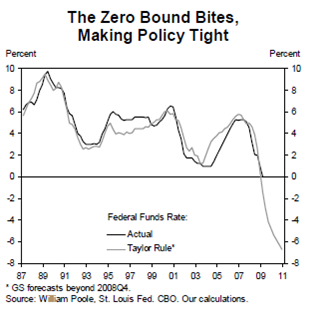 Taylor Rule suggests that the interest rate should have been about negative 6%, so "zero percent" was far, far too high. But of course you can't actually set negative interest rates. What can be done? Lots of stuff. Sumner has a FAQ listing lots of ideas. Price level targeting. Run a liquid futures market on future NGDP. Stop paying interest on bank reserves. More "quantitative easing". "Helicopter drop" cash into the country. Force inflation up to (or above) 2%. Etc. Ironically, Ben Bernanke (currently head of the US Fed) had exactly this kind of advice for Japan, in 2003. Alas, the (same!?) Bernanke in 2008, who by then ran the US Fed, did not follow his own advice (for Japan) from five years earlier. But the facts [about the negative effects of deregulation] are pretty solidly on my side. I disagree strongly, but that's another large rabbit hole that would perhaps be distracting in this thread. For sure. And in the current jobless recovery, we can talk about (for example) the rise in GDP, without a drop in unemployment. But I think that, in general, GDP is a pretty close proxy for what we care about. For example, if we care about the young, poor, unemployed, it matters a lot whether we talk about creating new jobs, vs. giving them money by taxing the rich. Those are very, very different approaches. But it *is* a moral question. How wealth is distributed in a society [...] people who lost their jobs and can't find new ones. I share this unemployment concern, and I want to get those people new jobs. But the question is: whether "income inequality" in particular, is a moral question. Are you happier if everybody is poor and unemployed, rather than allowing a few lucky people to be rich (while the majority are unemployed)? If it turns out (hypothetically) that the best way to create new jobs for the unemployed, is to allow the rich to stay rich, would you still be unhappy, just because income inequality would remain? I deny that income inequality (by itself) is a problem for society to solve. Poverty, yes. Unemployment, yes. But not income inequality alone. > Are you happier if everybody is poor and unemployed, rather than allowing a few lucky people to be rich (while the majority are unemployed)? Actually yes, if it's a few *lucky* people. If it's a few *productive* people my answer would be different. What bothers me about the current situation is not the inequality per se, but that income is not correlated with productivity. The top earners are by and large not the top producers, they are the ones who are willing to lie, cheat, steal, crush their competitors by any means necessary, and work the political system to favor themselves at the expense of others. I suppose I think there's a greater correlation between income and productivity than you do. But we seem to agree on the rest of it. By all means, let's fight corruption, fraud, and evil.